Nurses who make home visits will be able to relate to this. I scan houses I would like to visit—to see not only who lives in them but how they live. What health problems or social issues would I have to address? 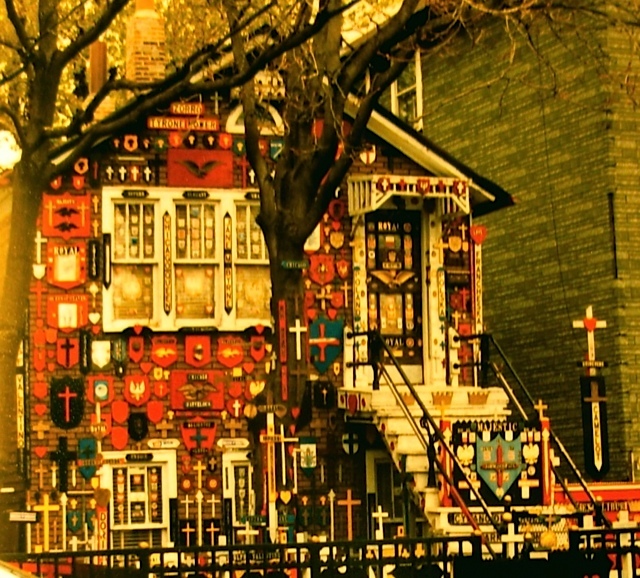 I took a picture of this house on the west side of Chicago before we moved to Maryland in the early ‘90’s. My good friend, Lois, drove me back there on a lovely June day in 2007 when I came back to Chicago to attend her daughter’s wedding. I was sad to see what happened to this house and even sadder that I never got to know who lived there. Dressed unlike any other house in the neighborhood. who displayed shields and crosses across your face. The day I left, I took your picture. You smiled in the sun. Years later, I stand before you. that scrape away your beauty? Your mantle in tatters exposing your dull skin. in this newly gentrified community? Very thought-provoking. Nicely done! And the photos are perfect for this piece. Wow. It looks like there’s no way to even enter the house anymore. What happened to the stairs, I wonder, and everything else? 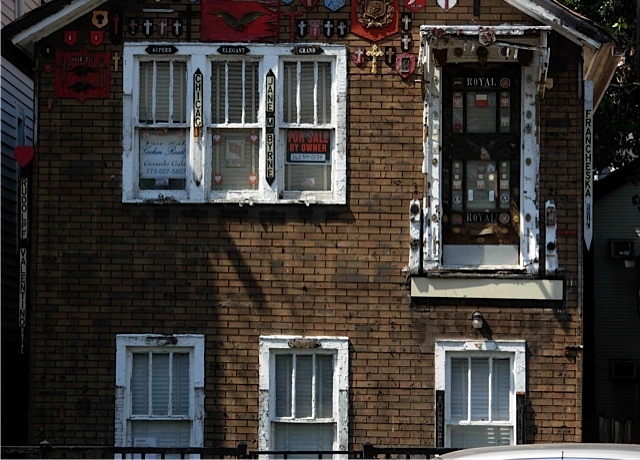 Love the photos and your meandering thoughts about the houses. Fond memories! It appears that there must have been a host of some kind of issues in that original house. Or, maybe there were none; with all that self expression, maybe they were the healthiest people on the block! Wish I could only know!